It’s May in Columbus. The National Deck and Railing Association asks you to evaluate whether your deck is safe. May is widely known for hosting Mother’s Day, Memorial Day, and graduations galore; but it is also National Deck Safety Month. While you are unlikely to buy gifts or host a party around this event, I hope it will serve as a reminder to do some quick checks around your porch or deck to make sure your outdoor living spaces are safe and ready for the spring and summer. Even though safety checks aren’t necessarily fun, they are far better than the alternative. Here are some tips to help you complete a quick but effective deck safety evaluation. The best place to start your deck check is on the internet. The North American Deck and Railing Association publishes a comprehensive Consumer Checklist that is the perfect reference for identifying potential problem areas on your Columbus deck or porch. The list covers everything from evaluating flooring for wood decay to assessing nearby trees for overhanging limbs that might come down in a strong wind. It’s all on one page and written in easy-to-understand language. You don’t need to be a construction pro to use it. 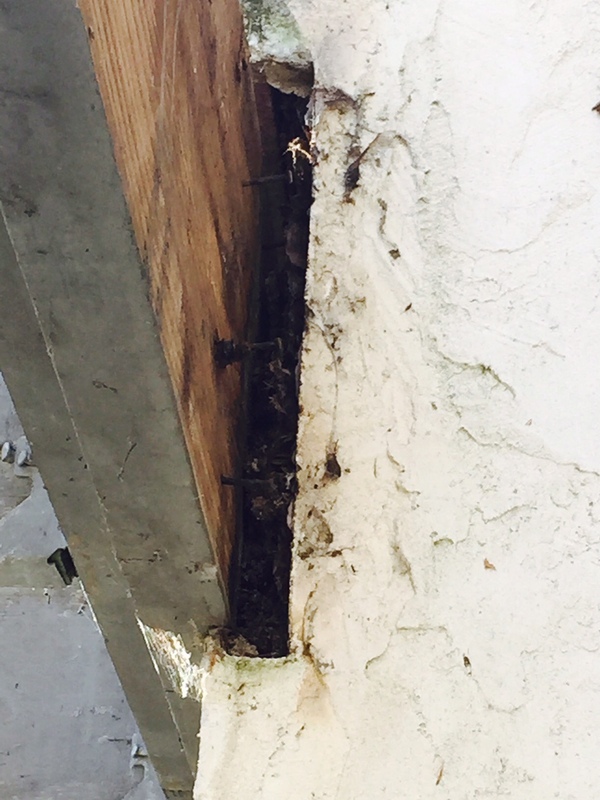 No flashing was used where this deck connected to the home causing rotting. Some common failures you may find go beyond being safety issues and are potentially damaging to the main part of your home. Failure to install, or properly install, metal flashing between the deck and the house can quickly lead to rot on both the deck and the house. 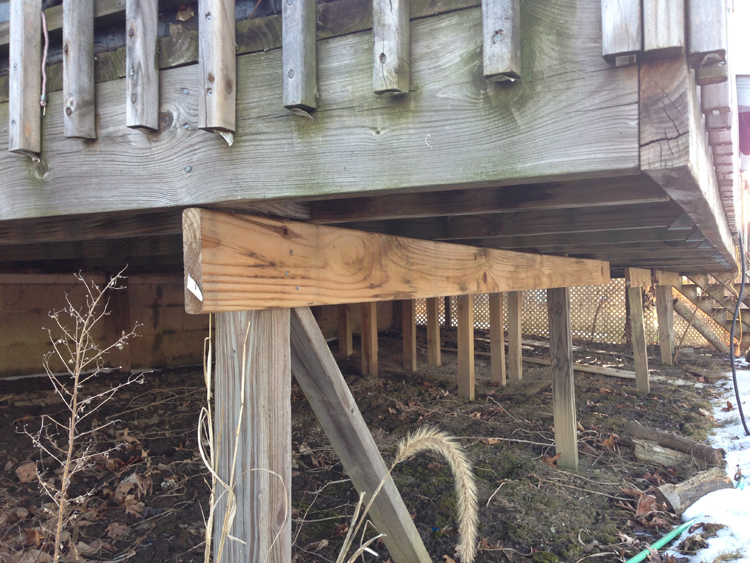 You can assess settling on a deck by checking it with a level. Deck settling can stress both your deck and your home along the joint where they connect. Building codes change. A structure that was built to minimum code 15 years ago may very well be out of compliance now. Archadeck builds for longevity and durability. We build to exceed minimum code requirements. You will see this in details like the size and types of bolts that we use ensure strength. Small investments like this can make a huge difference in the safety and lifespan of your Columbus porch or deck. This poorly made deck we inspected utilizes a 2×4 as a beam and insufficient screws instead of bolts. If you have railings or stairs, make sure to inspect them regularly for stability. Shake railings with some force to make sure that they are properly secured. Do your stairs shift or move when you walk on them? That indicates that you need to repair or replace them immediately. In the same way that you don’t want to fool with steering or brake issues on your car, you want to immediately address problems with porch stairs and railings. I don’t provide this information because I’m looking to get into the deck repair business– I’m not. Archadeck of Columbus primarily contracts for new construction and large renovation jobs. But if I can prevent even one accident by sharing some of my professional insight here, I’ll consider this National Deck Safety Month to have been well spent.